﻿ Apparitions « Haikasoru: Space Opera. Dark Fantasy. Hard Science. Miyuki Miyabe's first novel was published in 1987, and since that time she has become one of Japan's most popular and best-selling authors. Miyabe's 2007 novel Brave Story won The Batchelder Award for best children's book in translation from the American Library Association. 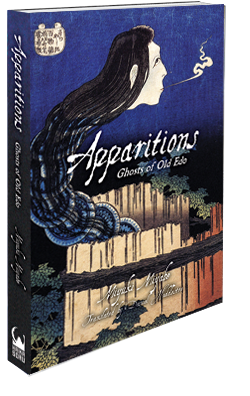 Seven of her novels have been translated into English, and Apparitions is her first short fiction collection to be so translated. That night near midnight, when O-Mitsu came round for her as she had promised, O-Yū felt, oddly enough, just a little bit relieved. It was easier to go ahead and get it over with than sit with her mind playing through one scenario after another. As O-Mitsu had instructed, O-Yū meekly folded up her bedding, set her pillow on top, and carried it all with both hands as she followed behind O-Mitsu until they arrived at the room that was known as the futon storeroom. O-Mitsu said not a word while they were walking down the corridor. Then, when they arrived and O-Mitsu placed her hand on the sliding door, she suddenly said something most unexpected, though she never turned to look at O-Yū. Indeed, yesterday had been the forty-ninth day. It was often said that the souls of the dead remained in this world until the forty-ninth day after their death and afterward went on to the next world. Because of that, O-Yū had been counting the days until her sister’s forty-ninth. She had been terribly worried that once that day had passed, her sister’s presence might dissipate. O-Mitsu nodded and slid open the paper door.